These easy, super soft cut out sugar cookies are perfect for decorating, with the best texture and a maple glaze to die for! Holiday baking season has officially begun at my house and I am not one bit sad about it. Halloween is great, but the minute it’s over I’m in full-blown holiday prep mode and right away start baking ALL the sweet treat things. 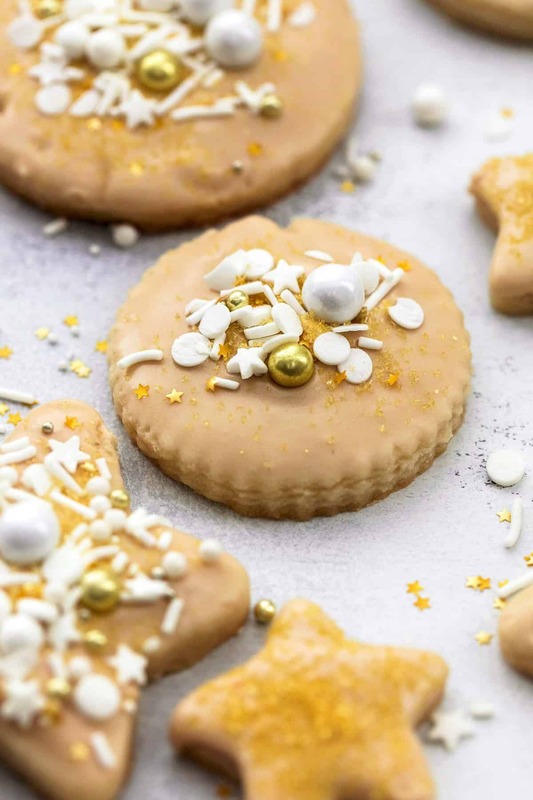 These gorgeous cookies taste even better than they look, believe it or not! I’ve partnered with Crisco to show you how using Crisco makes all the difference in creating a perfectly thick and soft cookie, with light texture and fantastic flavor. That’s quite a checklist for one cookie! 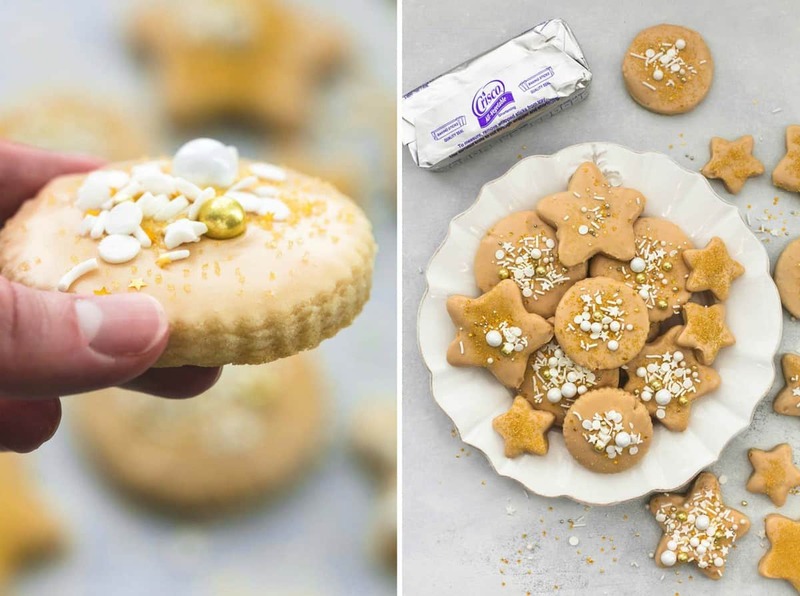 But when it comes to sugar cookies, there’s a fine line between mediocre and absolutely delicious and this recipe is definitely on the side of crazy, super delicious thanks to Crisco shortening. Crisco shortening can be stored at room temperature, it doesn’t have to be refrigerated! So if you’re like me and always forget until the last second that your butter needs to be softened, you’re going to love not having to fiddle with the microwave to get just the right faux-room-temperature butter. Science Fun Fact for the day: butter actually melts at a lower temperature than shortening does so cookies with shortening can bake longer before starting to spread! The result? Light-texture, thick and airy cookies every single time. I had my kids help make and decorate these fun sugar cookies, and then we delivered them to some of our neighbors. After dropping them off, I got a call or text from every one of the people we delivered to, raving about these cookies and dying to get the recipe. That’s how good these sugar cookies are! Better than any cut out sugar cookie I’ve tried before, hands-down. 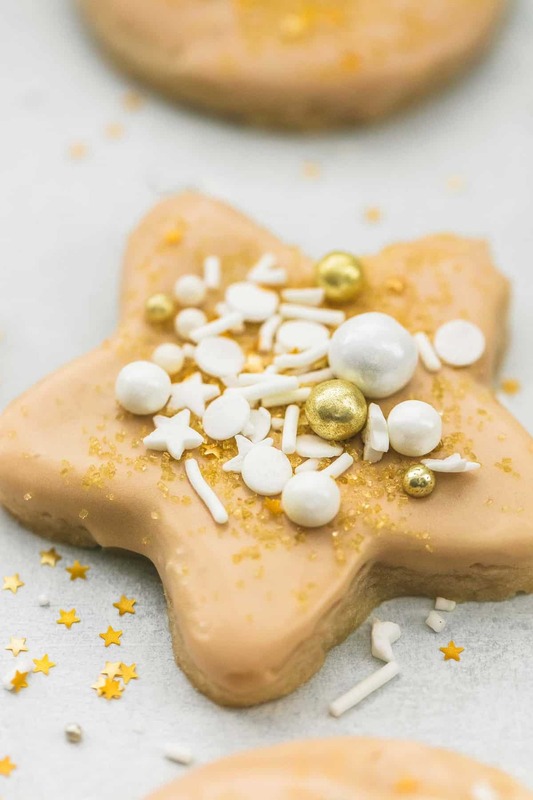 Your holidays aren’t complete without a batch or two of these maple glazed sugar cookies! Light and airy sugar cookies with a rich maple glaze. A must make for treat the holidays! Preheat oven to 350 degrees. In a medium bowl whisk flour, baking powder, and salt. Roll out half of the dough on a pastry board to 1/2 inch thickness. 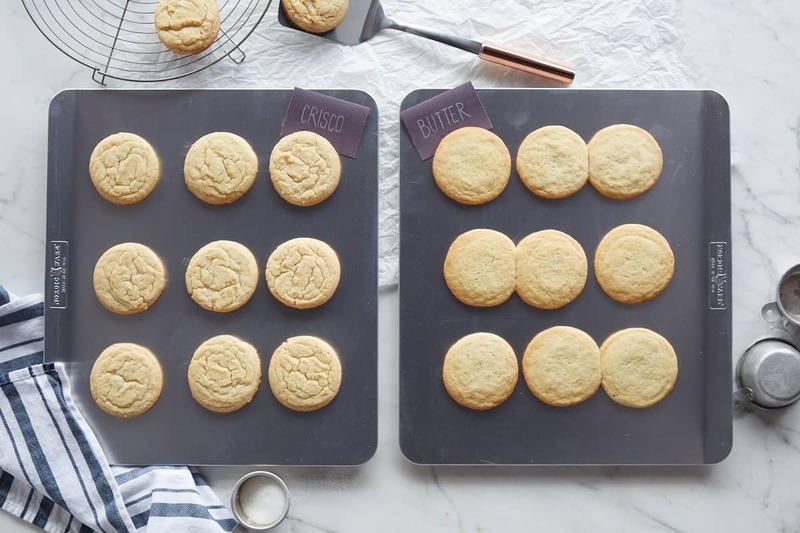 Use cookie cutters to cut out cookies, then place on a large baking sheet 2-inches apart. Bake in preheated oven for about 6-8 minutes (Cookies should start to brown just around the edges). Allow to cool completely on baking sheet. Cream together cream cheese and butter until light and fluffy. Mix in maple extract and salt. Gradually mix in powdered sugar until incorporated and cream until completely smooth. 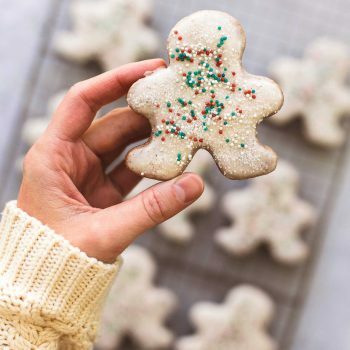 Try these other holiday Cookie Recipes you'll love! I love this! I think these will have to go on the Christmas cookie list! So delicate, so decadent, so beautiful yet simple ! Thank you so much ! I think a link might not be right. Could you link the maple frosting recipe to this page? It currently lists the gingerbread recipe. Thanks! Sorry about this- I am working as quickly as I can to get the correct recipe posted back to this page! Sorry about that- I am working to get this issue fixed as soon as possible! This url is supposed to be for the Maple Glazed Sugar Cookies which the page does reference at the beginning. However, the recipe provided is for Gingerbread Sugar Cookies. 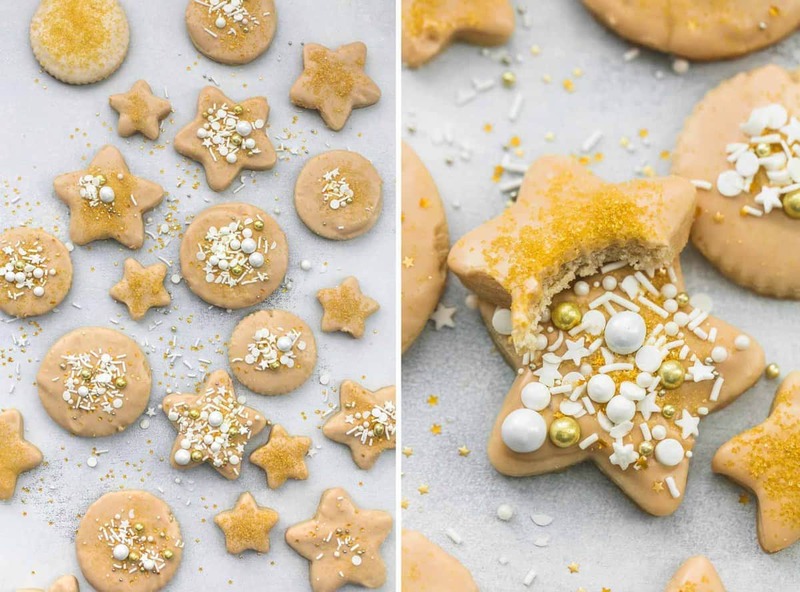 Where can I find the recipe for the maple glazed sugar cookies? I do see that the gingerbread cookies do have maple in the glaze, but sugar cookies and gingerbread cookies are not the same. I am a bit confused. Sorry about this!! I am working as quickly as I can to get the correct recipe posted back onto this page! Thanks for your patience! This link is supposed to be for maple-glazed sugar cookies, which the page does reference at the top. However the recipe is for gingerbread cookies (there is maple in the glaze for these gingerbread cookies). Gingerbread and sugar cookies are not the same. I am a bit confused. where can I get the recipe for the maple-glazed sugar cookies.